A few years ago I had the opportunity to work in an animal shelter. I was employed there almost a year and a half and experienced things that were simply heartbreaking on so many levels. With the amazing success stories, also came the realities of how people view and treat their pets, and the lack of responsibility. (Photo was taken a few days after her arrival) The reasons for abandoning pets is wide spread, not only on surrendering an animal to a shelter, but the online ads – and some of the excuses are simply ridiculous. Shelters will never turn an animal away, even if they are bursting at the seams, the alternative is it gets left in the street, in a box or dumped in the country. We are fortunate to have a great relationship with our shelter, and often times we will be contacted to take on a special case. Our next story is one of those cases. 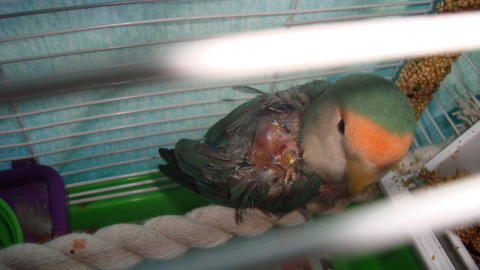 I received an email with the photo of a very bedraggled peach faced lovebird. This little bird was brought in as a stray and was noted to have some serious issues going on with her. After the legal hold turned up no owners – she was then turned over to us. 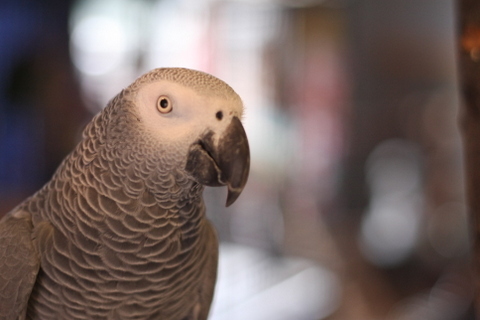 I met her the first time as she huddled in the back of her cage, not really moving much and looking as though she had been in a fight with another bird or possibly a cat – she looked terrible. I gingerly scooped her up and held her shivering body, she was a teeny little thing, she allowed me to examine her without fuss and it was then that I noticed the terrible shape of her leg – which appeared almost black – the lesions on her back and her overall thin condition – I don’t believe she was a stray, she could not fly, nor could she walk much, it was impossible that she flew into someone’s yard as a stray, she didn’t have the ability or the strength. Once at the vets, an examination showed her to be plucking, huge cysts all over her back and right wing, as well as a very swollen foot. In order to determine what was going on with the leg/foot, we had to do x-rays and surgery. On such a tiny bird, with medical issues, this was a HUGE risk – but we knew if we didn’t the painful injury could not be treated/repaired, and this sweet girl deserved a chance. 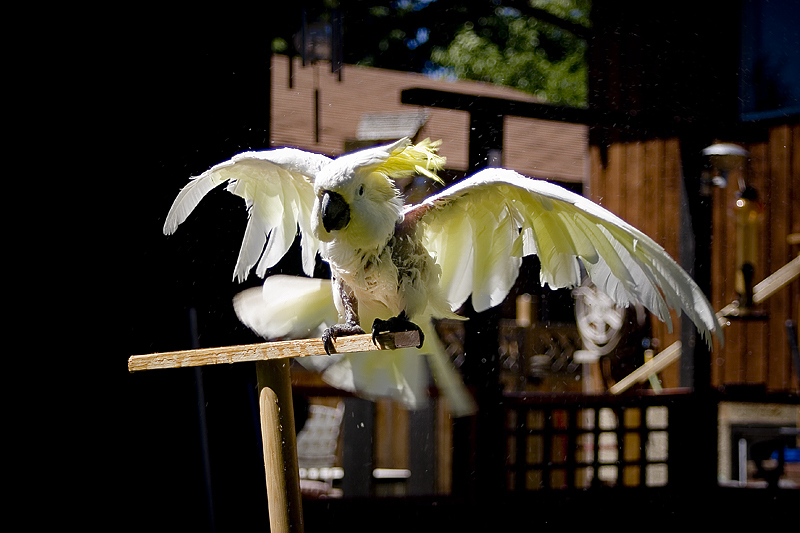 The x-rays showed no broken bones with her leg, but did show that her wing was fused to her body – full flight was impossible. Surgery was then started on the leg and the damage was found! At some point in the weeks – possibly months prior – she had a string wrapped around her leg. This string went through the tissue, muscle and was embedded in the bone. The string was removed and the leg cleaned up, now we had to wait and see if the foot would be viable – it was hugely swollen and discolored. The cysts on her back/wing were called follicular cysts – a few of them were huge – because they were impeding her ability to extend her wing, a further surgery was planned in the upcoming weeks to have this cyst removed. As the weeks progressed with bandage changes/medications, she became more vocal and outgoing and as her diet improved, and her pain subsided, she no longer appeared to be plucking quite as much. She found safety and comfort inside her hidey hut and spent a lot of time in there resting and healing. The bandages came off and although the leg was still swollen, it was healing, unfortunately there was no use of the foot – we had to continue to watch the leg to ensure it didn’t get necrotic or turn black, if that happened, she would lose the leg. The evening before surgery of the cyst, we prayed long and hard for her once again – by this time her story had made its way around the internet and a lot of people were also keeping her in their prayers – she had come so far in the past few weeks, and this was the final hurdle. The morning of surgery was incredibly hectic, of course the flock pick that day to escape cages and fight with each other and in turn this made me running late to drop her off. I grabbed the cage and hightailed it to the vet. Once there, we did the paperwork and they took her to the back to get her settled. Not long after the vet came out and said she needed to talk to me. My stomach dropped – what happened?? She came out holding her and showed me something remarkable. At some point, during the night, she had started picking at this cyst – she literally burrowed a hole straight down the center of it and it was deflating on its own – she did NOT need surgery!!! The area was cleaned up and we elected to put a collar on her for a few days to keep her from bothering the area. Within 10 days, that cyst was GONE! Her leg healed up over the months following and while the toes no longer work on her foot, she can use it to hop around and climb. Once the cysts went away, she’s never had another appear – the area was quite damaged by them so there is no new feather growth there. “Peaches” showed us true strength and determination and that regardless of size or species – every bird through our doors deserves a chance! She never gave up and we never gave up on her. The power of prayer, love and amazing vets..she made it!! 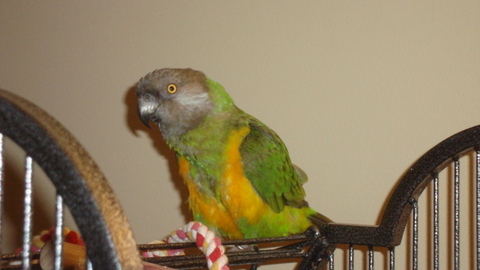 March 15, 2014 – Peaches died tragically in a house fire at Birdline along with 26 other companions. This little fighter holds a very special part of our hearts and we miss her every day..
She is just as cute as my Dewy, the lovebirds are fiesty and determined bunch. What a great story glad she made it, they are awesome little ones. Mine is a snuggler she doesn’t favor fingers but loves open hands.